This nighttime panorama of Europe was photographed by one of the Expedition 30 crew members aboard the International Space Station on Jan. 25, 2012. The familiar "boot" of Italy is brightly illuminated in a jaw-dropping nighttime panorama of Europe captured by an astronaut living on the International Space Station. One of the six members of the space station's Expedition 30 crew snapped the photo on Jan. 25, as the orbiting complex flew about 240 miles (386 kilometers) above the Tyrrhenian Sea, with NASA releasing the image only recently. Much of the European continent can be seen in the night shot, but the borders of the Italian peninsula are particularly well-defined and striking. 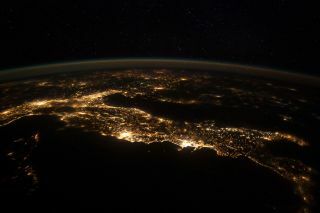 Flanked by the Tyrrhenian Sea on the left and the Adriatic Sea on the right, the gleaming lights of Italy run horizontally across the image frame. The bright clusters to the left and right of the center are the glowing lights of Rome and Naples, respectively. The islands of Sardinia and Corsica are visible in the lower left part of the photo. Beyond Italy, to the north and east, other European nations can also be seen. Currently, there are six people living and working aboard the International Space Station: Americans Dan Burbank and Don Pettit, Dutch astronaut Andre Kuipers, and Russian cosmonauts Anton Shkaplerov, Anatoly Ivanishin and Oleg Kononenko. From their orbital perch, spaceflyers often conduct Earth observation for science and public outreach. Through official NASA channels or other social media platforms, such as Twitter, space station residents have also been known to share intriguing videos and photos of Earth from space.